Several species of armyworms can be found in the Midwest each year. However, the development of economically damaging populations depends on a number of factors such as; cropping practices, date of planting, insect migration patterns, parasites and predators, weather conditions, etc. Fall armyworm moths are attracted to extremely late planted corn, which normally can sustain considerable damage from this pest. The fall armyworm moth has dark gray, mottled forewings with light and dark splotches, and a noticeable white spot near the extreme end of each. Newly hatched larvae are green in color and move in a looping motion. 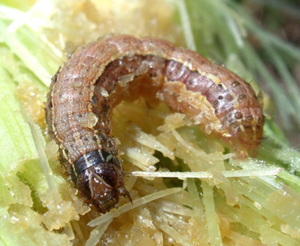 Fall armyworm larvae are smooth-skinned and vary in color from light tan or green to nearly black. They have three yellow-white hairlines down their backs. On each side of their bodies and next to the yellow lines is a wider dark stripe. Next to that is an equally wide, wavy, yellow stripe, splotched with red. Full-grown larvae are about 1-1/2 inches (38 mm) long. To differentiate this larva from other armyworm species or corn earworm one needs to look at the head of the insect. The fall armyworm's head has a predominant white, inverted Y-shaped suture between the eyes. Moths are typically attracted to fields of late-maturing corn to lay their eggs. The larvae are primarily daytime feeders. 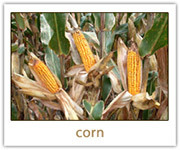 They appear in corn fields late in the season, from mid-July through harvest. Fall armyworm, unlike armyworm, are typically found damaging corn in patches throughout a field. Larvae feed on corn leaves and may attack the tassels and/or ears of corn. Their damage appears as ragged-edged holes on leaves, tassels and/or ears. 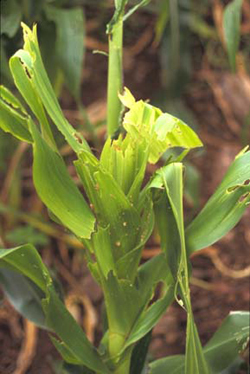 Severe feeding may give the appearance of corn that has been damaged by hail. 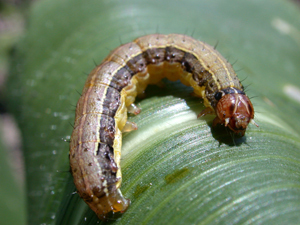 Scouting for fall armyworm is necessary only in fields where larvae or their damage are noted. Sampling should be conducted in 5 areas of a field. In each of the 5 areas, randomly select a plant as the first of a sample set of 20 consecutive plants. Carefully examine each plant to determine the number of damaged plants in each sample set. From these numbers, determine the percentage of plants damaged in the field. Also note the number of larvae observed and estimate their size (length). Finally, estimate the percentage of the field infested (eg., if 5 acres of a 50 acre field have larvae present, report it as 10% infested) and note the location of the infestation. Since some infestations may be outside the sample area (e.g., areas between sampling spots, border rows, waterways, etc.) with damage should be noted and evaluated. Fall armyworm may be found feeding during daylight hours, and they typically are found scattered throughout a field. Besides feeding on leaves, they may attack the tassels and/or ears of corn. The application of an insecticide is usually not economical for control of the fall armyworm. However, it may be necessary if the infestation is extremely severe and/or the plants are under stress. In such cases, if 75% of the plants exhibit whorl feeding damage and larvae are less than 1-1/4 inches (31 mm) long, and the plants are under stress, treatment may be advisable. If high levels of damage are noted in isolated areas of a field, spot treatments may be warranted. Consider when applying controls that fall armyworm frass (excrement) becomes so heavy that it can create a "plug" which prevents penetration of the insecticide into the whorl where the larvae may be feeding.